Download Patriotic sheet music for God Bless America, God Bless the U.S.A., America the Beautiful, The Star Spangled Banner, Before You Go and more here. 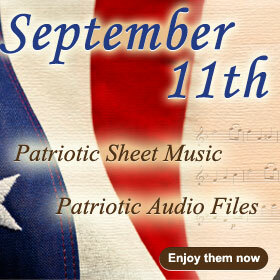 Save almost 60% when you download the sheet music with audio collection for seven American Patriotic Songs, including: The Star Spangled Banner, My Country, 'Tis of Thee (America), America the Beautiful, You're a Grand Old Flag, Anchors Aweigh, The U.S. Armed Forces Medley America - Eternal Father, Strong To Save and Yankee Doodle here. * Find more July 4th songs here. Save over 60% when you download the sheet music with audio collection for 12 Rockin' in the U.S.A Patriotic songs. Included in this digital collection is America, American Girl, R.O.C.K. In the U.S.A., Living In America, Born In the U.S.A., We're An American Band, Rockin' In the Free World, Young Americans, The Heart of Rock & Roll, Surfin' U.S.A., American Pie, Courtesy of the Red, White and Blue and is instantly available right here. The God Bless America sheet music book, for the Benefit of the Twin Towers Fund, includes 15 inspiring patriotic songs. Find sheet music for Amazing Grace, America the Beautiful, Blowin' in the Wind, Bridge over Troubled Water, Coming Out of the Dark, God Bless America, God Bless the U.S.A., Hero, Land of Hope and Dreams, Lean on Me, Peaceful World, The Star Spangled Banner, There's a Hero, This Land Is Your Land and We Shall Overcome. The American Classics book includes 20 songs. Find easy piano sheet music for Abraham, Martin And John, I Believe, We Shall Overcome, Amazing Grace, My Country, 'Tis Of Thee (America), America, The Beautiful, The Star Spangled Banner, Count Your Blessings Instead Of Sheep, From A Distance, Give Me Your Tired, Your Poor, If I Had A Hammer (The Hammer Song), This Land Is Your Land and more. The Let Freedom Ring sheet music book by Phillip Keveren includes 14 songs. Find piano sheet music for My Country, 'Tis Of Thee (America), America, The Beautiful, Anchors Aweigh, The Star Spangled Banner, Yankee Doodle Boy, Stars And Stripes Forever, Washington Post March, Battle Hymn Of The Republic, Yankee Doodle, You're A Grand Old Flag and more. The Greatest American Songbook includes 29 peace and patriotic songs. Find sheet music for I Didn't Raise My Boy To Be A Soldier, Liberty Bell March, The Liberty Song, Marine's Hymn, My Country, 'Tis Of Thee (America), Onward, Christian Soldiers, Our Flag Is There, Semper Fidelis, (Shout! Wherever You May Be) I Am An American, Stars And Stripes Forever, There's A Star Spangled Banner Waving Somewhere, Tramp Tramp Tramp, The U.S. Air Force, The American Patrol, Anchors Aweigh, Washington Post March, We Are With You, Yankee Doodle, The Battle Cry Of Freedom, Bell Bottom Trousers, Bonnie Blue Flag, Boys, Keep Your Powder Dry, The Caissons Go Rolling Along, Columbia, The Gem Of The Ocean (The Red, White And Blue), Flag Song, God Bless Our Native Land, God Save America, Hail To The Chief and The House I Live In. The Patriotic Songbook includes 21 tunes. Find piano sheet music for America (My Country 'Tis Of Thee), Marine's Hymn, The Battle Cry Of Freedom, Our Director (Bigelow F), America The Beautiful, The Caissons Go Rolling Along, This Is A Great Country, This Land Is Your Land, The American Patrol, The Star Spangled Banner and more. The God Bless America sheet music book by Irving Berlin includes 30 inspirational songs. Find easy piano sheet music for Abraham, Martin and John, Amazing Grace, America, the Beautiful, Count Your Blessings Instead of Sheep, Eternal Father, Strong to Save, From a Distance, Give Me Your Tired, Your Poor, God Bless America, I Believe, If I Had a Hammer and more. The Irving Berlin sheet music book contains 14 patriotic songs. Find sheet music for Angels of Mercy, Any Bonds Today, For Your Country and My Country, The Freedom Train, Gee, I Wish I Was Back in the Army, Give Me Your Tired, Your Poor, God Bless America, Song of Freedom, This Is a Great Country and more. Find more music books for popular American Patriotic songs here.